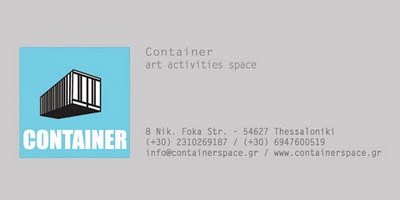 Container is a new art space at Nikiforou Foka Str. 8 in downtown Thessaloniki. The opening will take place on the 23rd of March with a group exhibition in which contemporary artists will participate with paintings, sculpture, instalaltions, performances etc. This show will last until the 10th of May. Apart from an exhibition space, Container's ambition is to develop as an active nucleus in the art world and as a point of reference for art events, establishing a more direct contact and communication between artists and the public, with special thematic evenings and hommages organized in collaboration with other entities. Their interest is also focused into other art forms like video, theatre, music, dance, photography, publications etc. They intend to present them in every given opportunity because "art in every form serves the same agony". They are open to suggestions and ideas and wish that Container becomes a space for anyone interested to communicate with the public through art. 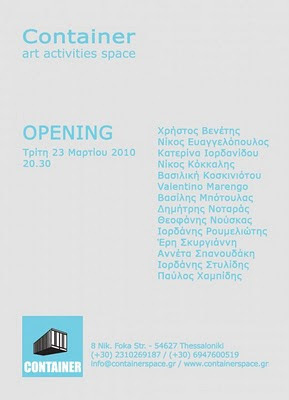 The participating artists are: Christos Venetis, Nikos Evangelopoulos, Katerina Iordanidou, Nikos Kokkalis, Vassiliki Koskiniotou, Valentino Marengo, Evangelia Bantiaka, Vassilis Botoulas, Dimitris Notaras, Theofanis Nouskas, Iordanis Roumeliotis, Eri Skyrgianni, Anneta Spanoudaki, Iordanis Stylidis, Pavlos Hampidis.